Place a piece of string cheese near the bottom corner of one egg roll wrapper (keep remaining wrappers covered with a damp paper towel until ready to use). Fold bottom corner over cheese. 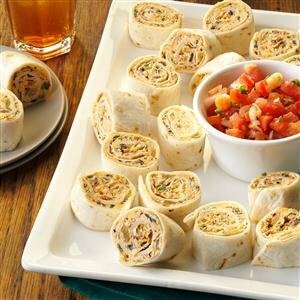 Roll up halfway; fold sides toward center over cheese. Moisten remaining corner with water; roll up tightly to seal. Repeat with remaining wrappers and cheese. In an electric skillet, heat 1/2 in. of oil to 375°. Fry sticks, a few at a time, for 30-60 seconds on each side or until golden brown. Drain on paper towels. Serve with marinara sauce. Makes 1 dozen. Look for egg roll wrappers in the produce section. Be sure to get wrappers labeled egg roll wrappers and not spring roll wrappers. Egg roll wrappers are soft and bendable while in the package. Spring roll wrappers are usually thin, stiff and call for a dip in water to soften them. For ultra crispy fried foods, the key is having the oil hot enough. If your mozzarella sticks are sogging out, kick your oil temp up a couple of notches. 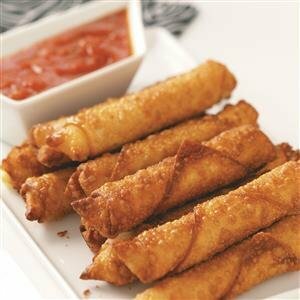 These are also super yummy dipped in soy sauce or sweet chili sauce. In a small bowl, beat cream cheese, sour cream, picante sauce, taco seasoning and garlic powder until smooth. Stir in olives, chilies, cheese and onions. Spread about 1/2 cup on each tortilla. Roll up jelly-roll style; wrap in plastic. Refrigerate for 2 hours or overnight. Slice into 1-in. pieces. Serve with salsa. Makes about 5 dozen. In a 5-qt. 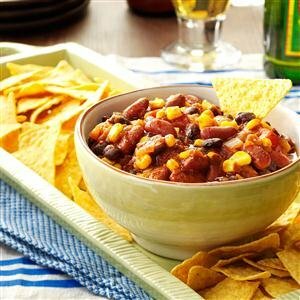 slow cooker, combine the first eight ingredients. Cover and cook on low for 5-6 hours. Serve with tortilla chips. Makes about 7 cups. Note: To make Taco Joe Soup, add a 29-ounce can of tomato sauce to the slow cooker. It will serve 6-8.